Looking for something to grill this weekend…look no further!!! And this might just be my new favorite. I *think* I enjoyed it better that a Guac-Topped Burger. I *think*. Here’s the deal. Make your favorite burger, and while it’s grilling, saute some onions with a “condiment sauce.” Give the “condiment sauce” some zing. 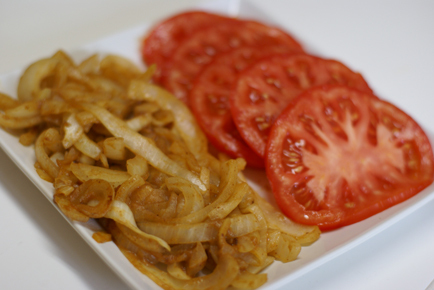 To make the Spicy Onions: Add the sliced onions to a skillet and begin to cook over medium-low heat. In a small mixing bowl, whisk together the vinegar, ketchup and mustard. Add to the onions. Then add 1, or 2, or 9, drops of Tabasco or other smoking hot sauce. Zing! 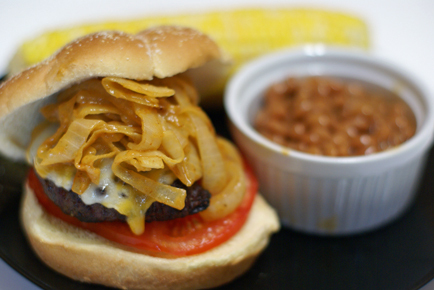 Serve Burgers with Spicy Onions on top! Double Zing!! That sounds really yummy! I would probably toss mine in a foil tray on the grill and cook them while the burgers cook. I so love onions like this on my burger! The more the better! Thanks! THESE LOOK SO GOOD! I am going to a cabin on a lake this weekend and I am adding this to the menu! Thanks so much! I love a good burger that tastes different and this one is sure to please…thanks! This sounds delicious! Homemade burgers just don’t compare the pre-made store bought variety, and making your own variations can really spice up your summer dinner menu. I have once made burgers with onion soup mix to hold them together. I found that it worked much better than eggs. I just added the soup mix and Worcestershire sauce to the ground beef and made it into patties. I made the spicy onions tonight with our left over camping food! My husband loved them! Thank you!